Be the first to share your favorite memory, photo or story of Juan . This memorial page is dedicated for family, friends and future generations to celebrate the life of their loved one. 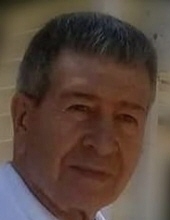 Juan F. Guzman-Torres, 72, of Willimantic, husband of Milagros Ingles passed away Monday February 25, 2019 at his home. He was the son of the late Francisco and Emmelia (Torres) Guzman. Born on March 8, 1946 in San Sebastian, Puerto Rico, he worked as an auto mechanic for 21 years. Besides his wife, Milagros, he leaves his daughters, Marilyn Guzman and her husband, Steven Chesworth , Karen Guzman and her husband, Juan Louis Vializ, and Debrah Guzman and her husband, Ricardo Torres; sisters, Carmen Guzman and her husband, Jose Enrique Rios and Anna Guzman and her husband, Henry Burgos; grandchildren, Nicolas Chesworth, Juan Louis Vializ and Ricardo Louis Torres; 6 sisters-in-law, 4 brothers-in-law, and many nieces and nephews. Relatives and friends may call on Thursday February 28, 2019 from 6 to 9PM at Iglesia Cristiana Pentecostal 20 Hope St, Windham. Funeral service will be Friday March 1, 2019 at 8am directly at the church. Burial will be in New Willimantic Cemetery. To send flowers or a remembrance gift to the family of Juan F. Guzman-Torres, please visit our Tribute Store. "Email Address" would like to share the life celebration of Juan F. Guzman-Torres. Click on the "link" to go to share a favorite memory or leave a condolence message for the family.